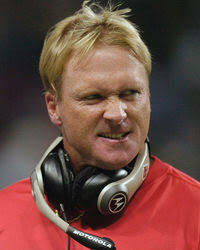 Craig Ball: Jon Gruden: Do you have much to offer those around you? Jon Gruden: Do you have much to offer those around you? Jon Gruden is currently a football color commentator on Monday Night Football. He has won a Superbowl with the Tampa Bay Bucs as the head coach. I have always liked this quote and because it mimics the workplace as well as the classroom. Teachers, Coaches, and Bosses want you to succeed...and would like to see you improve. For this helpfulness to continue at a productive pace...the student, athlete or employee must put in the effort to also strive for improvement. Without improvement or simply a lack of effort...could lead to a focus in other areas or people. If I stop pushing you...if I stop demanding of you...if I stop getting on you...then I probably don't think you have much to offer.